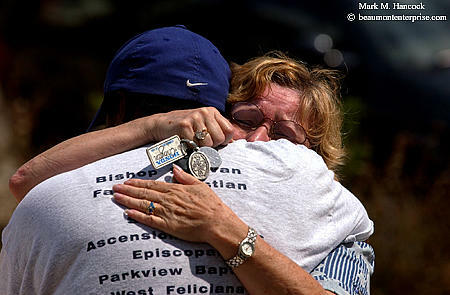 Debra Peters (left) and Connie Stephens (right) hug and cry in Covington, La. on Wednesday, August 31, 2005. 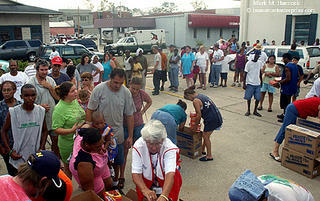 Both had worked for the Parish Clerk of Court office for St. Tammany. It was the first time either had seen any of their coworkers since Hurricane Katrina hit earlier this week. Retired firefighter James Hannan, a volunteer with the Beaumont Red Cross, wipes away sweat as he arranges emergency relief truck in Covington, La. 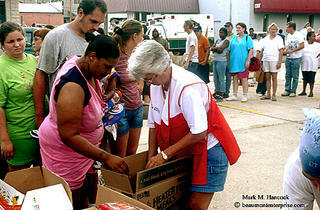 (above and below) Retired nurse Shirley Castloo (right), a volunteer with the Beaumont Red Cross, rations emergency relief to residents in Covington, La. 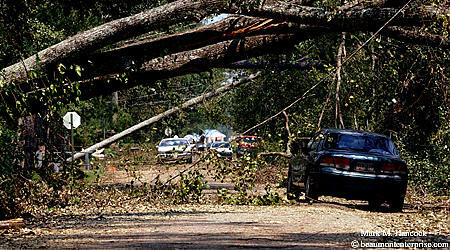 A car tries to navigate a maze of fallen trees and powerlines in a Covington, La. neighborhood. This neighborhood had already been initially cleared to allow emergency vehicles enough access. 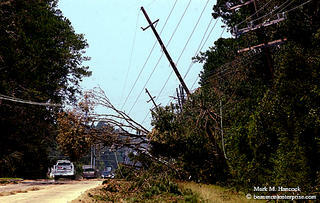 Most areas remained completely blocked by fallen trees and powerlines. Cars are turned away at the Causeway Toll Bridge into New Orleans. Only local residents, emergency workers and some credentialed media are permitted onto Highway 22. 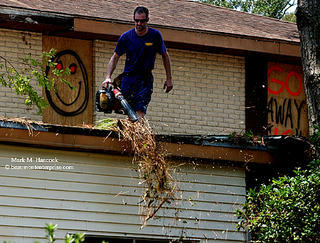 Homeowner Ben Begley uses a gasoline-powered leaf blower to remove debris from his roof in Mandeville, La. In addition to the smiley face, a boarded window reads, "Go Away 'K'." (above) Trucks take turns passing under dangling trees and power lines along Highway 22 in Southeast Louisiana. (left) CLECO crews repair power lines along Highway 22 in Louisiana. 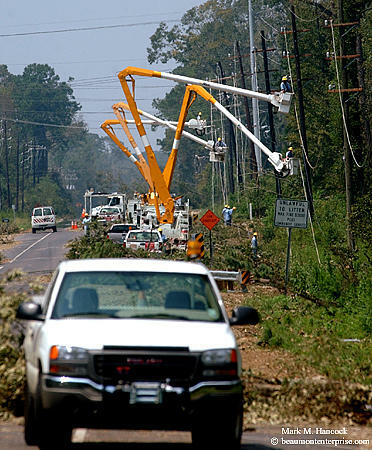 Southeast Texas Entergy repair crews rushed to Baton Rouge to help residents after Hurricane Katrina ripped down trees and power lines. 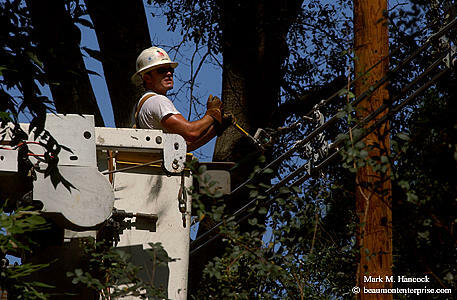 The crews expect to be in Southeast Louisiana for many months before they can restore power to all the areas affected by the storm. Service vehicles stage in the parking lot of the Mall of Louisiana before workers begin to restore power to parts of Baton Rouge, La. on Tuesday, August 30, 2005. 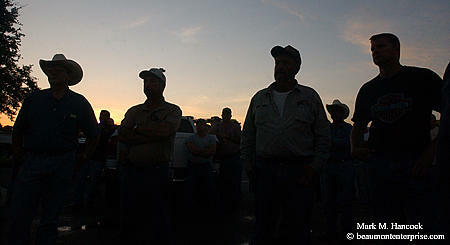 (above and below) Entergy workers from Southeast Texas listen to a safety briefing in the parking lot of the Mall of Louisiana before they begin to restore power to parts of Baton Rouge, La. 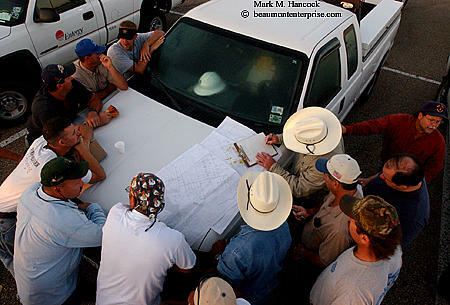 Southeast Texas Entergy workers study maps of power lines in the parking lot of the Mall of Louisiana before they begin to restore power to parts of Baton Rouge, La. 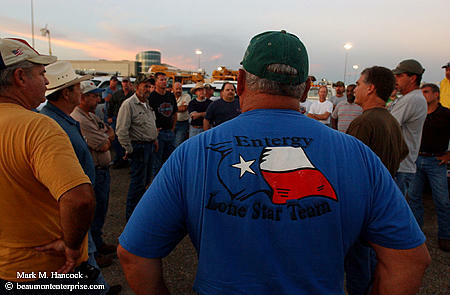 Silsbee utility foreman Sloan Holland of Sour Lake listens to the concerns of his crew in the parking lot of the Mall of Louisiana before they begin to restore power to parts of Baton Rouge, La. 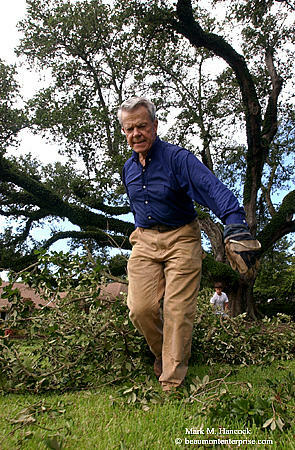 (right) Bob Rackley (left) and his grandson Houston Howell, 12, (right) remove fallen limbs from two Live Oak trees in Baton Rouge, La. 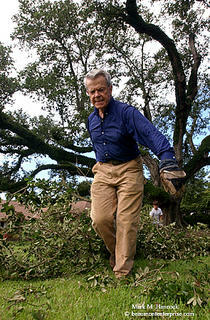 Hurricane Katrina knocked limbs loose from the two trees, which are both certified as more than 250 years old. 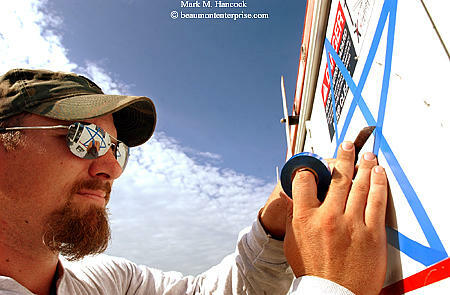 Rackley is originally from Nederland. Southeast Texas Entergy crewmember Casey McIntyre of Vidor makes Lone Star decals out of electrical tape on trucks as the crew waits for poles to arrive so they can restore power in Baton Rouge, La. 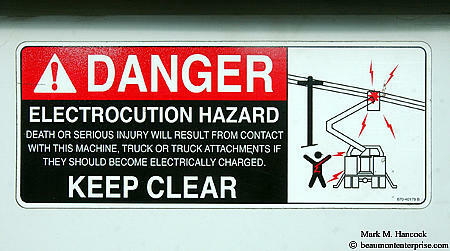 A decal reminds Entergy crews from Southeast Texas about the dangers they face as they restore power. (left) Raymond Sanders of Daisetta and Jonathan "Podunk" Simon of Orange with Entergy secure a power line to a new pole as they work to restore power. 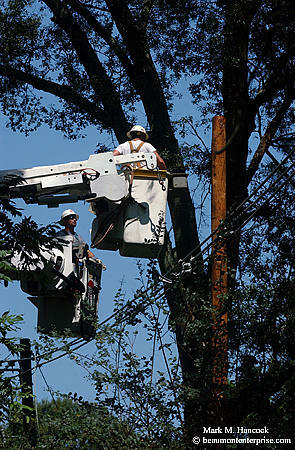 (below) Entergy lineman Jonathan "Podunk" Simon of Orange works to restore power in Baton Rouge, La. (left) A sport utility vehicle from Florida moves down a street where trees have fallen over powerlines in Baton Rouge, La. 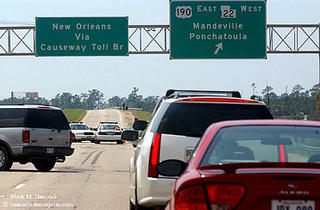 after Hurricane Katrina. 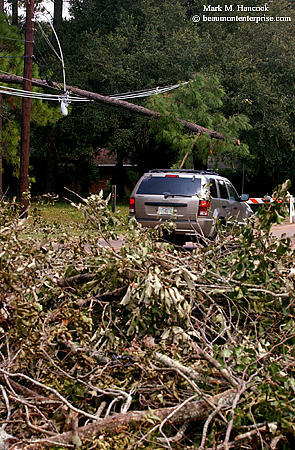 Energy crews began work in Baton Rouge to get power to the most folks possible. They plan to work their way toward more severely damaged areas. However, the process will take a long time and is hindered by the large volume and size of trees in area, which is densely wooded. Cutting crews were clearing roads of trees near major power lines to assist the energy crews. Amber Tezeno, a freshman education major, unwinds in the Setzer Center during the first day of classes at Lamar University in Beaumont on Wednesday, August 24, 2005. I had time to work this assignment and follow light. I love when I can look for strong, natural light. However, it's rare news PJs to have time to look for light because we are governed by deadlines and assignment times (which often overlap). When time is critical, we get the best shot we can with whatever is available. Sometimes we're lucky and get nice light, but more often it's a combination of available light and color-balanced flash. Also, while shooting at Lamar, I found myself feeling somewhat out of place. Frequently, I blend in and do just fine. But on this one day, it was obvious I wasn't part of the crowd. While I was looking for the play of light on people, I found myself drawn to people who not only were in the light, but also looked separated from their environment. It could have been the stress of getting back to studies, the expectations of others or simply not being part of the new group, but the light pointed out a few folks to me, and I was happy to have the help. West Brook's Jordan Lewis (No. 7, top) makes a touchdown as he's tackled by Ozen's London Durham (No. 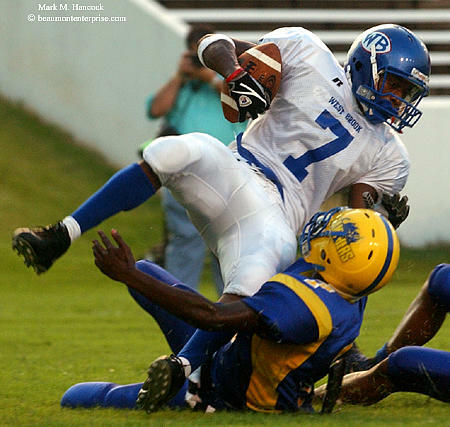 7, bottom) during a non-district football game at Lamar University in Beaumont on Friday, August 26, 2005. A vintage amateur race starts at Motorama Speedway near China on Saturday, August 27, 2005. 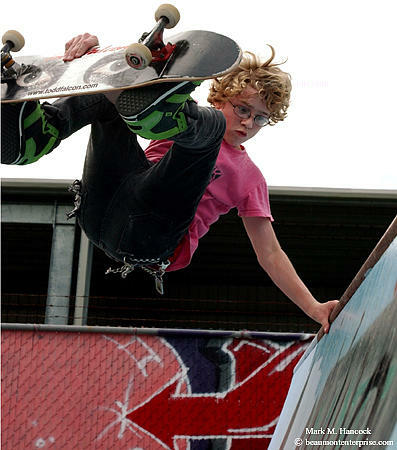 Ben Raybourn of Houston performs tricks with the Todd Falcon Team at the Police Activities League's Five-O Skate Park in Beaumont on Saturday, July 9, 2005. Pro skateboard star Todd Falcon appeared with his demo team and band to promote his skateboard DVD and music CD. Volunteer Caitlin Rexses hands out balloons to visitors before the ribbon-cutting ceremony for the Catholic Charities Central Services Facility on Eastex Freeway in Beaumont on Saturday, August 13, 2005. Ribbon cutting and ground breaking ceremonies are death on a stick. It's best to arrive early or stay late to get anything other than the ficticious "event." Both types of ceremonies are unimaginative and cliche. Consequently, PJs need to really work them hard to eliminate any possibility of seeing their name under an image of someone cheesing the camera with oversized, cardboard scissors or folks in suits and skirts wearing brand new, cheap hardhats with a foot on a gold-painted shovel. 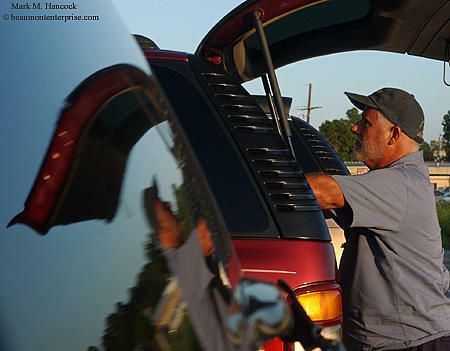 James Boren of Lumberton inspects a used 2002 Chevy Tahoe he expected to buy at Classic Chevrolet in Beaumont on Friday, August 19, 2005. Gasoline prices have created an excess of large used trucks for sale while new car sales have moved toward more fuel efficient vehicles. Stacy Broussard, a sophomore psychology major, studies in Mirabeau's coffee shop during the first day of classes at Lamar University in Beaumont on Wednesday, August 24, 2005. 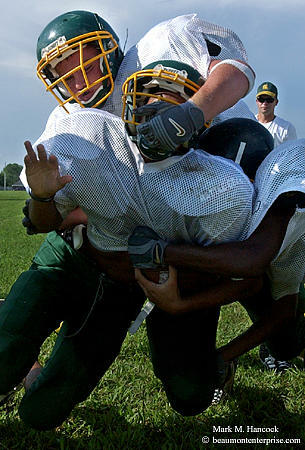 Rob Ashabranner dominates a fellow Warrior player during football practice at Cathedral Christian High School in Beaumont on Thursday, August 18, 2005. 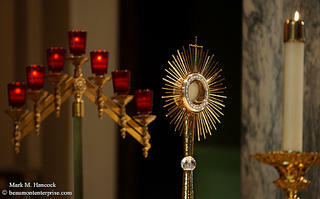 (Above) A monstrance blessed by Pope John Paul II is on 24-hour display at St. Anthony Cathedral in Beaumont on Tuesday, August 23, 2005. It holds the blessed sacrament for communion. 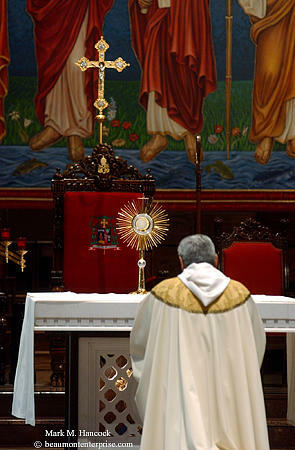 (Right) Monsignor Richard DeStafano prays over a monstrance blessed by Pope John Paul II during mass at St. Anthony Cathedral in Beaumont. 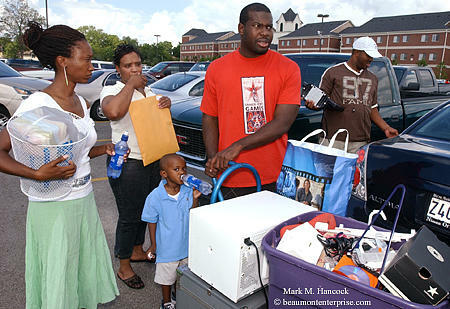 Family members move freshman Djuana Eaglin into the Cardinal Village apartment complex during move-in day at Lamar University in Beaumont on Saturday, August 20, 2005. Family members (from left to right) are Sibu Mkwanazi, Valencia Eaglin, Amar McNeal, 3, Kobina Amoo and Terell McNeal. David Leeson dropped me a note about his new blog. It's located at www.davidjleeson.com. He's been working on it for a while, so it's already got some interesting posts. As expected, he creatively writes about issues most of us will never experience. It's an excellent read. Y'all drop by and give him some love. I'm placing it at the top of my staff blogs on the sidebar. Sorry Marie, but I know you'll understand why. PJs are different and, like images, resume packages should be original and tell employers about individual PJs. A typical (economical) resume package costs around $10 to send. Most PJs who are seriously hunting for a job send at least 20 packages (if not more). It represents a major investment while excluding the time involved (when a freelance gig could have earned $300 to $500 per hour). Let's factor all the components: research time, package preparation, package expenses, postage, preparation time, mileage to and from the mailing center. A resume package could easily be worth about $500 or more to the sending PJ IF no special images were created solely for the resume, which drives the price higher. When this much cash is on the line, PJs are well advised to invest wisely. This means PJs shouldn't try for jobs out of their league or waste money on a bargain basement jobs. Instead, go for the jobs with the best fit or one notch above the current working position. However, also send resume packages to "dream jobs." I did so many years ago and, to my surprise, I was a finalist for a job I didn't know was available. During the same time, I got another dream job, but life is strange. The standard package has three core components: a cover letter, a resume and a portfolio. If PJs have business cards or promotional postcards, include one of each as well. All of these ingredients must be absolutely perfected. Any minor problem is a potential rejection. To be certain everything is ready, have others critique the package components. Challenge them to find anything questionable. While it's important to stand out from the herd, it's more important not to be cut , slaughtered and served at a burger joint. Although this sounds like a recipe for mediocrity, it's not. PJs must create unique resume packages. Just as every image only requires exposure, focus and timing, each resume package can be as unique as each image. The goal is to have the most technically and esthetically pleasing package of the group applying for the job. A standard package includes a cover letter and resume in a matching envelope along with a CD portfolio in a jewel case. These items are placed inside a larger bubble-wrap protected envelope and sealed. The rest of the package is a matter of style. Some PJs send flat resumes inside protective covers, place everything into binders or make custom comb-bound books. As long as it fits into a reasonably-sized envelope or container, it's open for interpretation. However, be cognizant of the total weight of the package. The mailing cost difference between a bubble-wrap envelope and a padded envelope is about a buck - slightly more than the savings between the two types of envelopes. So, if a PJ decides to decoupage a resume onto granite slabs to get attention, s/he might want to reconsider the option before shelling out the extra freight charges. For most PJs, the mailing address, return address and portfolio label (if used) are typically printed on adhesive labels. It's safe. However, PJs skilled in calligraphy may want to hand print the information on the CD label, internal envelope and possibly on the package envelope. In the old days, PJs included return packaging for slide portfolios and possible reject letters. Now, it's common for PJs to request the recipient keep the CD on file for future jobs or freelance assignments. Not only is this approach initially cheaper, it's potentially more lucrative for PJs who picks up addition freelance gigs while waiting on new or different staff jobs. If using this approach, it's extremely important the CD contains links back to the PJ's online portfolio and contact information. Because a PJs online presence is universal, as long as editors have the CD, they can locate the 2nd choice PJ for a later opening or a freelance gig. This brings up the subject of keeping an online resume up to date at all times, but it's a subject to discuss at another time. Collect the package components, make sure the names are correct and get it out the door. Time is on the side of the first job applicants. They become the standard against which new contenders are measured. They also clear the first hurdle on job searches with deadlines. Finally, they cross the desk while the editor is still interested. After many sub-standard resumes, editors may lose interest in reviewing many new portfolios. Beaumont native Kendrick Perkins (No. 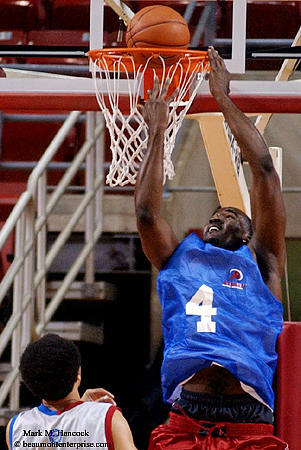 4, right) of the Boston Celtics throws some flash into his game against streetball all-stars at the Lamar University Montagne Center in Beaumont on Saturday, August 20, 2005. We've discussed the portfolio, resume and where to look for staff jobs, how to research newspaper circulations and even how to create a job hunt database to track applications. Now we need a cover letter. Don't think of cover letters as a way to gently put a foot in the door. Instead, think of them as a way to scream your name from the back of the crowd at the Super Bowl. It should be forceful enough to convey your best selling points before you run out of air and the editor runs out of patience. I've posted a sample cover letter on the PJ Glossary site. It earned several job offers at nice newspapers, so it's generally successful. Since I'm the only person who fits the description, it's pointless to copy and paste this cover letter. Instead, below is a point-by-point breakdown of the letter to customize it to each PJ's level of experience. The header section of a cover letter primarily makes sure the package gets to the right person. It also allows for a reply and sets an informal deadline. The return address is a standard introductory block of information. It says who the PJ is, where s/he is located and how to contact her/him. Because I include my online information in my resume, I don't duplicate the information here. If the job is already filled, this is all the information the editor really needs. The address is accurate and addressed to a specific person. Be careful with the spellings of names and the publication. Some publication names deliberately deviate from common spellings. If using a template, double check the pub name against the contact name. It would be entirely too embarrassing to mail a resume package to one publication while the contact name belongs to their direct competition. Ouch. It's good to double check the mailing address posted in a job opening against the address the PJ already gathered. Typos can happen anywhere - even in a job posting. Look at the PO Box and Zip code for inverted numbers. If the posting stated the attention line should be for a particularly-titled person, use traditional (and sometimes non-traditional) methods to get the correctly spelled name of the person who currently is in the particular position. It immediately shows the recipient a PJ's investigative skills and resourcefulness. For dated job postings, the date lets the editor know the deadline was met for the application. It allows the package to clear the first hurdle. Although the date isn't particularly needed on unsolicited applications, it subtly reminds editors how long they've sat on a resume. Although I think the word "Dear" in front of a name is archaic at best and disingenuous at worst, this is an old business with many old, formal traditions. Unfortunately, the word "Dear" is one of those traditions. It's probably best to include it at least for the next few years. Again, the resume package should not be sent to "Whomever it concerns." Use the $60k education and know exactly whom it concerns and use the name. As Eminem eloquently raptures in "Lose Yourself,"
This opportunity comes once in a lifetime yo." Each paragraph, sentence and word in the cover letter must be bulletproof to a trained editor of words. This is the only chance for PJs to ask for a job and explain why they're better than the rest of the applicants. Since most PJs are humble folks, a cover letter is difficult to write because most PJs don't want to appear brash or arrogant. Unfortunately, aggressive PJs get the job while gentle PJs allow it to happen. 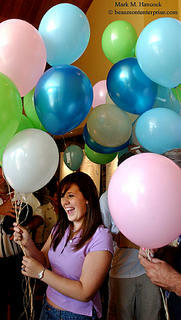 Resume packages represent a substantial outlay of cash. Don't waste the money or let others trample dreams by being anything other than the top candidate and letting the deciding editor know this fact. This is a blunt explanation of the resume package. It lets the addressee know why this expensive package now sits on a desk. The first sentence states the PJ wants a specific job. The second sentence explains the PJs strongest selling point(s). Some PJs also include a third sentence to explain where they saw the job posted, but it tends to weaken the opening message. This paragraph should strongly answer job requirements. It reads like "me, me, me," but it's a necessary evil to lead to the final conclusion: "I can do all this for your readers." The first sentence is clerical skills. The second sentence addresses stress. The third sentence clarifies adaptability. The fourth sentence states cooperation as well as healthy competition. The last sentence brings the paragraph home. This paragraph explains special skills of immediate use to the newspaper. Fluency in foreign languages and extended overseas work would be prominently displayed here. It also closes the cover letter and motivates the editor to look at the portfolio by foreshadowing specialized visual techniques or abilities. In my example, the first sentence explains technical competencies. The second sentence explains a high level of professionalism over time and experience level. 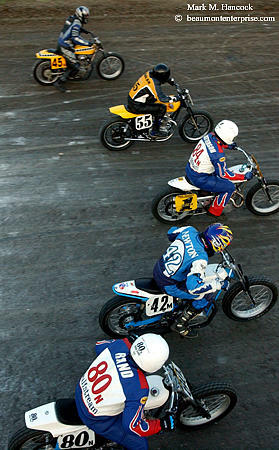 In retrospect, I could include a few more skills, but (hopefully) the editor looks at my images and gives me a shout. This section is again a traditional nicety. It merely contains appreciation for consideration a signature and decryption of the scrawl. Kids In Motion program camp counselor Valencia Aplon (top, center) watches Brittani Sparrow, 9, (right) jump rope at Charlton-Pollard Park in Beaumont on Tuesday, August 2, 2005. The camp is a program of the Southeast Texas Family Resource Center which was partially funded by the Weed and Seed program. The U.S. Attorney for the Eastern District of Texas announced a large-scale bust of crack dealers in the Charlton-Pollard area of Beaumont. The bust was conducted by a task force of federal, state and local law enforcement agents after a two-year investigation. Partial funding of the investigation was provided by the Beaumont Weed and Seed initiative. Kids playing in the park doesn't exactly say "crack bust." Unfortunately, my only other option was officials talking at a lectern. 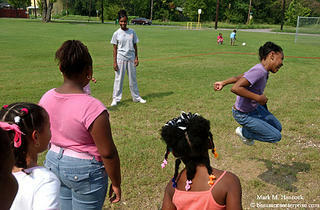 It's still interesting that the positive program for neighborhood kids also busted their less-than-positive neighbors. We've discussed the portfolio and where to look for staff jobs, how to research newspaper circulations and even how to create a job hunt database to track applications. Now we need a resume. Our resume is for a specific desired position (typically posted on a job information bank). While the local newspaper might be happy with a few e-mailed images or an online portfolio and resume, our resume is designed to snag a decent job with a living wage. Here's what I think works because it works for me. Other PJs should do what works best for them. If the editors at major metros offer a gig to PJs with recycled newspaper and duct tape resumes, good for those PJs. In the old days, job hunters would type, correct, type, correct and finally perfect a generic resume on paper. Then, they'd go to a printer and have 100 copies of the same exact resume printed. They'd stuff 100 envelopes, drop them in the mail and wait for responses. Computers introduced additional areas of job competition (and weeding points for editors). Now, resume packages must be superior and customized to specific editors and publications. The cover letter, resume and portfolio CD must be specifically designed for the publication and the person who picks the next employee. All forms of communication need to include the hiring person's name or the publication's name. Like the portfolio, it must also convey a coherent message of professionalism (and possibly quirkiness). If not, it's two seconds away from a form "Thanks, but no thanks" response (if any). Some believe paper quality is a measure of the sender's worth. Consequently, use a high-percentage cotton paper and matching envelopes. This paper is sold at most office supply stores in fancy boxes of 25 sheets. The matching envelopes should be somewhere nearby. If possible, it should match the PJ's business cards. High-quality stationary is expensive if the job hunt is long, but it should pay for itself in the long run. Even if an editor isn't impressed with the paper quality, high-quality stationary won't be the reason a PJ didn't get past the first round. However, cheap paper could. Stationary color is important. When applying to a professional job, use professional colors. The most common colors for PJs are cream, light blue and light gray (flat, granite or marble) with some minor texture (linen). Although neon colors (orange in particular) grab attention, it may not be the optimal choice for a resume. If the color of the stationary makes it difficult to read the print on the page, consider another color. There is a serif vs. sans serif debate. Studies say body text with serifs and headlines with sans serif fonts are easiest to read. Personally, I go with Times New Roman (serif) across the board because it's a professional font - boring, but professional. Unless you're really confident with your name recognition and design abilities, avoid multiple fonts. The "ransom note" approach is often interpreted as youthful over exuberance. Since many editors prefer seasoned PJs, the ransom note might not get far. If a PJ doesn't buy my rationale, at least keep font patterns consistent throughout the whole package. Don't change to traditional after the cover letter. While we're at it, keep text aligned left and at a reasonable font size (12 point) and avoid all capital letters (read as a scream). Finally, eschew exclamation points. The latest trend is to list everything an employer could ever want to know about a possible new PJ. Supporters think it's important to list each program of competence, each nuanced specialty, etc. Honestly, editors are too darn busy and want to know who the PJ is, what they've done, if they need additional training and if they can provide a needed specialty (languages, access, lighting style, etc.). New PJs may need to note their skills and experience (media law particularly). This lets employers know the PJ can be an asset rather than a liability. An additional drawback of the novella resume is weeding points. Employee searches are like photo contests. All PJs start out equal. Most choose to eliminate themselves. When faced with boxes of resumes in addition to the normal daily workload, it's understandable for editors to eliminate as many as they can before reading the entire content of each package. Weak resumes will be eliminated early. The remaining resumes and portfolios are reviewed. The reasons resume packages are rejected are as numerous as the editors who must slog through the portfolios. For premium jobs, immediate rejections occur if a PJ has no degree, has no background, has a non-news portfolio (different genre), or is incredibly sloppy. Secondary elimination points are lack of professional awards and lack of pro affiliations (NPPA, SPJ and SND are favored). Next, PJs must navigate the personal preferences of the editor (again varied by editor) as well as unexpected problems on the editor's desk (bad moods, portfolio review interruptions, resume left on conference table, resume placed with rejects instead of keepers, coffee spilled on CD or resume, etc.). Aside from the out-of-control issues, full-scale resumes can give editors other chances to reject resumes. If editors don't want to read entire resumes to get facts, they won't. Additionally, if the barrage of information doesn't have the exact program version the newspaper uses, it's yet another reason to reject an applicant. I only list my contact info, objective, education, job titles/employers, awards, affiliations and references on my hard copy resume (online version is different). It may be too simple, but anyone who wants to hire me understands I know all the appropriate computer programs, media law and other essential job qualifications. Otherwise, I wouldn't have the previous jobs or awards. If needing a resume from scratch, here's a way to construct it. If others have already had success with their resumes, go with what works. Like news stories, the first page is the only page read unless the editor is compelled to continue reading. It's the job applicant's mission to inform the editor of unique qualifications and pull the editor through the application process. Consequently, a tight resume lets editors know the PJ appreciates and values the editors' time. One page is good. A two-page resume works for experienced PJs with many awards. The third page is unlikely to get a serious look on the first round. The contact information should be the first part of all correspondence. If PJs get into the keeper pile of resumes, making an editor search for a phone number could move the resume to the reject pile. The contact block should include the PJ's name, home and mobile numbers, home address, e-mail address (preferably a private e-mail rather than a corporate [subject to review by supervisor] address), Web sites and other contact information. I also include my blogs here. I'd rather a potential employer know about my blogs and review them before they hire me. I don't want to be dooced down the road. It's also a good idea to have separation of blog and work in writing before accepting a job. Otherwise, the new employer might feel they have the right to interfere with, influence or lay claim to blog content. This is a very specific explanation (one or two sentences) of an applicant's desired job. When applying for a specific job at a specific publication, it should match the job posting on both counts. Example: Professional photojournalist seeks a full-time staff photojournalist position at XYZ Newspaper. If the job posting is for a staff photographer, apply for the "photographer" position. By adding the publication's name, it customizes the resume for the client and let's the editor know the PJ wants this particular job. It's not an application to "anywhere in the Northern Hemisphere." The next sections can be in any order, however this order might work best. This is a major weeding issue, so let's get it resolved rapidly. List any degree(s) obtained, the full university name and the year(s) each was obtained. If a PJ's GPA was particularly good, include it. Otherwise, it's assumed everyone has a 3.5 (of 4) or better GPA. If not, be ready to explain low grades during the pre-screening call - explanations better be good and true. This is another weeding point. If the job requires 10 years experience at a daily metro newspaper, two years at a 5K weekly won't work. Likewise, three years of daily photo experience at a portrait studio is not the same as three years at a daily paper. The last 10 years are fine for this section. Add military and years of service to get some bonus points with some editors (or lose points with others). New PJs may want to substitute skills for experience. List skills as bullet statements to show competencies expected for the job description. These are typically listed on job postings. Don't list skills unless the PJ has a proven competence. Good editors eventually ask to see proof. More experienced PJs might list current job duties. Again, the top-listed duties should apply directly to the position sought and job description. Although old timers appreciate the ability to develop and print film in a hotel bathroom, it doesn't apply to modern PJ jobs. The listed awards should be PJ, design or journalism related. It's interesting if a PJ won a ballroom dancing competition, but it doesn't apply to the job. Depending on the PJ's experience and competitive inclination, there are several ways to list awards. Below are the three most common. 1) Reverse chronologically: Place the newest awards at the top as they are acquired. 2) Award level: Awards are grouped by ordinal number (1st, 2nd, 3rd, finalist, honorable mention). 3) Prestige level: Awards are listed by competitive factor (Pulitzer, WPP, POYi, state awards, collegiate, parks and recreation department, etc...). This is a minor weeding point. If the publication pays dues, most folks join. If it doesn't, some might not join. However, it's a rapid way for an editor to assess the ethical and professional background of a candidate. 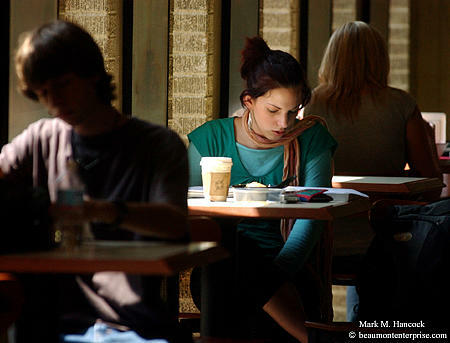 College students and those considering the profession should be members of both NPPA and SPJ. Membership includes subscriptions to News Photographer magazine (NPPA) and Quill magazine (SPJ). They are both good cover-to-cover reads for beginning PJs and pros alike. Both offer substantial student membership discounts. It's reasonably affordable to be a member of both while in college. If anything is hotly debated, it's references. As a general rule, it's best to include name, phone number and e-mail addresses for references in a hard copy resume. This information rounds out the second page of a tight resume. It also provides an editor with the immediate information to fill the job. For online resumes, state references provided upon request and link the words "upon request" to the PJ's e-mail address. It's unlikely to solicit requests, but it keeps the PJ's references on the PJ's good side (a critical issue). Channing Norton, 18, of Cleveland drives a ball during the STPGA Golden Triangle Junior Golf Tournament at Bayou Din Golf Club in Beaumont on Tuesday, June 21, 2005. She won the tournament. 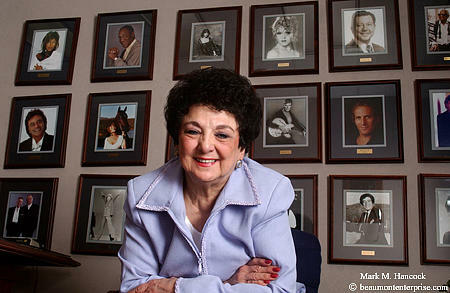 Christus St. Elizabeth Hospital assistant administrator Dorothy M. Yentzen poses for a portrait at her office in Beaumont on Wednesday, June 8, 2005. She's quitting her job after years of service to the hospital and community. 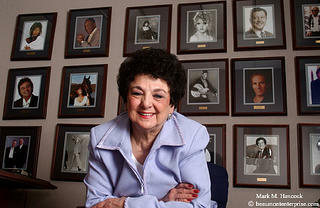 The photos behind her are of national talent she arranged for annual galas. I asked her specifically if she was retiring or quitting. She said she was quitting. It's always good to double check all assignment information. Retiring after many years is expected. Quitting is not. Stylist Tisha Louviere (right) with Strands of Port Neches treats Ashton Doty, Miss Port Neches 2005, (left) to a "stress relieving treatment" during the first Port Neches and Groves Business Expo at PN-G High School in Port Neches on Thursday, August 4, 2005. I had never seen this at a business expo before. (Left) The pungent corpses of Gulf menhaden fish, also called commercial pogy, rot in the sunlight along a one-mile stretch of Sea Rim Park on Wednesday, August 10, 2005. 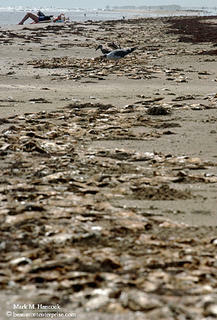 Authorities said a commercial fishing net broke and spilled several hundred tons of the fish. (Below) The shell of a crab lays atop a pile of Gulf menhaden fish. The fish have washed ashore since Saturday. 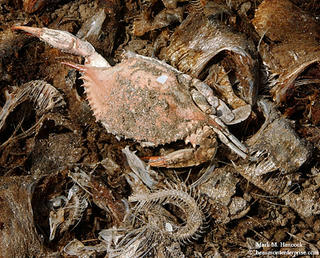 (Right) Gulls pick through the scraps of rotting Gulf menhaden fish near a sun bather. 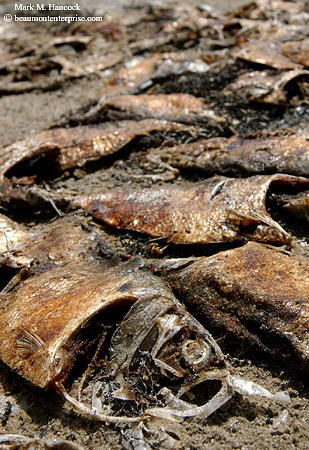 The fish are used in fertilizer, cat food and some cosmetics for their strong oil. The fish pose no environmental danger or danger to humans. This post is for advanced college PJs and super-advanced amateurs who want to dabble in the field one night each week. I'll get back to the "get a job" series next week, but this is a time-essential post. Fall is the ideal time to knock on doors at the local newspapers. For some Southern readers, football is the only reason newspapers exist. Consequently, they expect to see their favorite teams in action each week throughout the season. Each newspaper has a different audience, but one thing is universal: no newspaper has enough PJs to cover all the sports they must cover. This is where stringers become valuable. Note: if reading this post in the winter or spring, the spring season builds to a crescendo of simultaneous championships, rather than starting with too much work. Spring is good for newbies, fall is a time for some degree of experience. A stringer is an infrequent, paid, freelance contributor to a publication. Unlike professional freelancers, stringers won't make a living with PJ work. Stringers work primarily for clips to get better gigs, or they're so-called "daddy stringers," who cover the game anyway for their child. 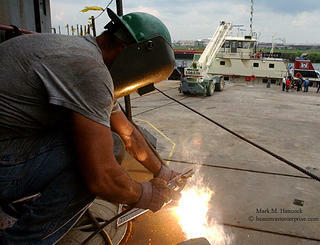 Many "daddy stringers" are former staffers who decided to make more money in other professions, but still love the work. Most stringers are happy with the weekly beer money and have a steady income elsewhere (a "real job" or student loans). Being a stringer isn't bad unless a PJ wants to be a freelancer or staffer. Then, stringing is a hard life because it requires literally stringing together enough small gigs to pay some bills. To get stringer gigs, do the same as if applying for a staff PJ job. Send a shooter's resume (include awards, degrees and experience), a CD and a cover letter explaining a desire to freelance. If the paper is small enough, they'll keep stringers busy until the playoffs when staffer(s) can handle the entire workload. Even the big papers try an extra stringer or two for the first few weeks of football season. However, if an amateur has never shot for a newspaper before, don't go knocking on the door of a 100k daily metro and expect a gig. First, aim low and don't ruin a future. New stringers are most likely to make a major mistake. If the major mistake is as a stringer at a 5k weekly, it isn't a career-halting event. If it's at the largest newspaper in the surrounding five states, it is. Newspaper editors stay a long time and remember all negative moments. Be a good memory, not a bad one. PJs live in a very tiny world and reputations travels fast. If all goes well the first season, try the bigger paper next year. PJs' reps proceed them either way. Understand if a newspaper has a high-power photo staff. If the huge papers steal staffers from a particular regional paper, there's a reason. Big papers don't keep fishing the same pond if the fish aren't big enough. Consequently, be adequately humble when asking for gigs at "springboard" papers. Springboard papers are low-pay pressure cookers, but editors at the big papers see the names and understand the dues paid. Editors at springboard papers know the value of their position and consequently demand more than normal from stringers. Also look at clip competition results. If the local paper has one or two staffers on the top 25 list, they'll expect a high level of professionalism and creative images. There is no excuse for a failed assignment. A blown gig is a stringer's last assignment. 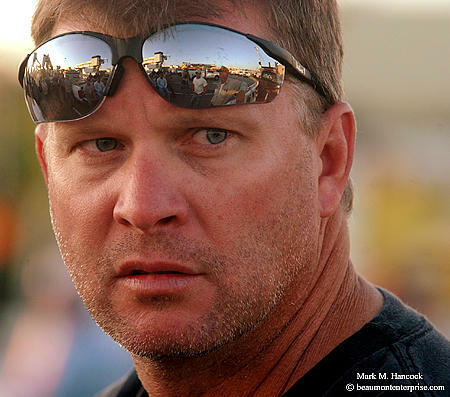 At very small papers, walk into the office with some images and ask to talk with the sports editor. At medium to large papers, call and ask for the name of the assignments editor as well as a phone number and e-mail address. Major metros require interview appointments and references. A PJ has landed an appointment with a large newspaper photo editor. Now what? The PJ should arrive early, dress professionally and have everything needed to complete an application or sign a contract and view a portfolio (a lightbox or laptop). Bring a extra portfolio CD as well. The mailed-in CD is currently a coffee coaster. I understand this is an honor not a "job." The readers are the reason we get to work. I'll NEVER make a cutline mistake. I'll take any assignment without a complaint. I'll make every deadline I'm given. I'll arrive at every assignment before its start time even if I must hitchhike to the event while I should be at the hospital after the horrible train wreck destroyed my Ferrari. I'll be aggressive in getting the best images without causing problems. I'll not leave my assignment until I'm certain I have what the paper needs. I won't do anything to embarrass the company or its employees. I will dress and act professionally. I'll do my best and add to the value of the paper. While working on assignment for this paper, I won't promote any side businesses. I subscribe to the newspaper and know some of the shooters. I could keep this list going, but these are the critical issues to the assignment editor. 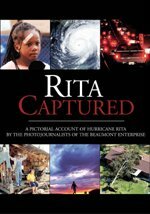 The editor wants someone who doesn't complain or cause problems and delivers consistent and compelling images before deadline. Remember stringers work for the paper to allow one of the staffers to handle "important stuff." To the stringer, a 2A gymnastics meet should be as important as a Super Bowl is to staffers. If a stringer doesn't shoot the 2A meet, a staffer must be pulled from the Super Bowl game. The portfolio should only have a PJ's best shots. Don't pad it. If a PJ is only happy with five shots, only show five shots. Meanwhile, it's good to show some versatility. Stick to the competition categories: sports, news, features, photo stories, and one illustration. The editor is primarily concerned with a stringer's ability to handle light, make proper exposures, gain access and get accurate and complete cutline info on a tight deadline. These are the core functions of the stringer (aside from the courage thing). Lastly, the editor may try to trip a stringer with some cheeky questions. All American newspapers are "family" newspapers (this means the kiddos can see every page without a chaperon). The editor expects shooters to return with G-rated images. Hard news can be PG. Staffers are the only shooters who get to shoot PG-13 and only the top shooters in extraordinary circumstances get to consider R images (after much debate among several editors and possibly lawyers). NC-17 will never run, so don't shoot it and don't even act like you're interested in shooting it. Do what was promised. Deliver quality images on time without problems. At larger papers, stringers may not get assignments for quite a while. Just send the assignment editor friendly reminders on Friday mornings and the day before holidays that you're available (if something happens to one of their regular stringers). If you get a gig and do well, then the process continues for a few more months. After enough successful gigs, stringers can work into the regular Friday night line up. Again, if a stringer blows an assignment or isn't available when the paper needs the stringer, the gig is over. If a PJ manages this, they're ready to move on to Sportraits. Charles Tucker of Channelview paints a mural on the gym wall at the new Deweyville High School in Deweyville on Thursday, August 11, 2005. 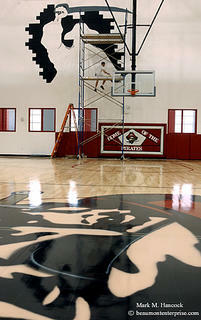 He has painted most school murals from Brownsville to New Orleans including the Toyota Center. Let's get back to the job hunt. I'm holding a long entry about the actual resume package because we need to discuss the details of the package and its contents before the package makes much sense. Today, let's discuss job hunt information. Then, we'll dive into the submission items and actual package. It's easy to send many resumes and hope one lands in the right place at the right time. However, let's be pragmatic and remember the job market is saturated while new PJs enter the market and the market itself is contracting. It's a harsh combination for new PJs and a difficult combination for experienced PJs. We need a plan to organize our job hunt efforts. We'll need to track everything we do to avoid redundancy, ensure complete coverage and target desired jobs. I prefer using a computer database. However, an index card file or three-ring binder would do the same job. If one of the alternatives works better for a PJ, use it. A job hunt database is simple to begin. It's merely a table of information in a consumer software package. Most programs have a start-up wizard or another helpful way to understand how to set up the column/field names. I prefer to work with a database in list view. Then, I can easily access the files if the phone rings. I'll immediately know with whom I'm speaking, and other pertinent information to make the most of a short conversation. Once I have a hiring editor on the phone, I could easily change to form view to see all the contact information. An additional benefit of working databases in list view is the ability to navigate and fill cells rapidly with little effort. Newspaper: Full name, not call name. Contact: Formal name and call name (if different). E-mail: This takes some hunting or ask for it upon phone contact. Phone: We want a direct number rather than the general newsroom number. Result: This is the most critical field. It contains the dates and actions of each contact with the potential employer. Web site: This allows research and some backtracking abilities. Address: Where the resume packages are sent. Find a physical address, even if only a PO Box is listed. A blank database is useless. It requires, you know, data. Once a simple database is created with the categories (field names) above, PJs can research the market. They can acquire information and have a place to store it for use later. Database work can be done during down time. After business hours, nobody answers phones or e-mails. This is the best time to research for the next day's actions. The Internet is available 24/7. Use time wisely. We've already discussed how to research newspaper circulations and where to find PJ jobs. These plus other pertinent information about potential employers comprise the core info in the database. A bizarre reality of a job hunt is the end result. As soon as we become good at finding a new job, we stop. Thus, we become rusty and forget what we already know. Then the cycle begins anew a few years later, either through necessity or desire. If young PJs start a methodical path to the top, their careers are less likely to stall. They also avoid many career pitfalls, which ironically create new openings for other PJs. College and high school PJs are well advised to spend weekends researching when the cash flow is too tight for beer night. Graduation comes faster than we expect. A database built throughout a career proves invaluable when it's time to look for a new job. Each additional job hunt becomes part of the cumulative wealth of knowledge the PJ has. This research also has a secondary use. After a great job is found, PJs use the contact information to arrange freelance shoots for other newspapers when something local applies to another newspaper's readership. Info junkies could research and make a fat database, yet never get a job. At some point, PJs must stop researching and start using the database to get a job. Consequently, we need an action plan for the database while it's being built. When I sought a new job, I forced myself to act as each entry was completed. I made some mistakes with this approach, but I would've made the mistakes anyway. At least I was doing something with the information, and it eventually got me another job. We'll discuss some mistakes to avoid in the forthcoming entries. The results field is the most important part of the database. It lets PJs know what actions and reactions have happened. If every attempt resulted in failure, then try something new. The information scrolls backwards so we can see the most recent information first. This one cell of information lets me know how I found the job, their corporate affiliation as well as each action and reaction to its conclusion. There is a similar cell for every newspaper in my database of 380 American newspapers. Some entries only state "too small." However, in 10 years, I might find the circulation numbers have jumped dramatically. Then, I add a plus or minus to the circulation to show it's growth or decline. For example, an 800,000 circulation newspaper is noted as "800." If the paper has contracted by the next update, we note it as "795-5." Likewise, an upstart newspaper may have been 5,000 circulation and had a huge surge in circulation. It would be noted as "125+120" (hint, probably a good place to consider). If there is no change, I list it as equal or "700=." BTW, my freelance database has 1591 entries with 55 specific fields. I work with it to generate freelance business. I check each file as needed, and update the info. As with any data over time, changes happen. New people are hired, new titles are created, publications vaporize while others are born. As long as the starting point is well documented, it takes minimal research to discover any changes before making contact again. Major metro newspapers have their status because they survive changes over time. The core information in a job hunt database is likely to remain constant because the newspapers have a vested interest in product consistency. Meanwhile, PJs have a vested interest in market research. 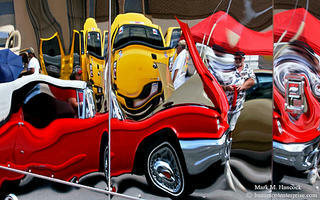 Auto enthusiasts reflect off the door of a semi-trailer as they mingle before the Texas Style Hot Summer Nites cruise near the Crockett Street Entertainment District in Beaumont on Saturday, August 13, 2005. (Above) Ship fitter Scotty Storey (left) welds on a ship as dignitaries tour the Evanick (right), the first of four towboats constructed for the Army Corps of Engineers, at Orange Shipbuilding in Orange on Tuesday, August 9, 2005. 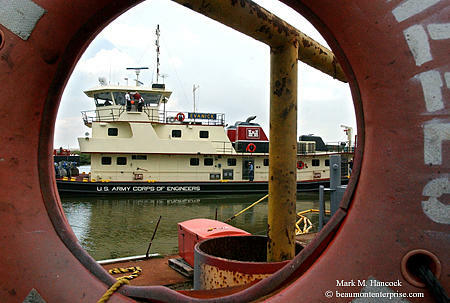 (Below) The Evanick takes dignitaries for a tour of the Sabine River near the shipyard. 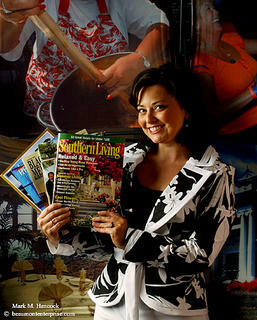 Stephanie Molina, director of marketing for the Beaumont Convention and Visitors Bureau, poses for a portrait at her office in Beaumont on Thursday, June 23, 2005 with some of the magazines that have written about Beaumont in the last month. I tried to talk her into setting the magazines on fire while holding them to show "Beaumont is Hot," but she wouldn't go for it. It would've been a really cool image if she had. 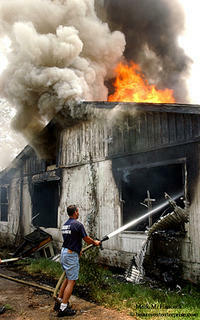 Larry Ancelet, an Orange resident and volunteer firefighter in Vinton, La., battles a house fire in the 700 block of 28th Street in Pinehurst on Tuesday, August 9, 2005. He held down the fire until the Pinehurst Fire Department took over. (Above) Kevin Kulhanek, 18, poses for a portrait with his truck in Kountze on Friday, July 29, 2005. 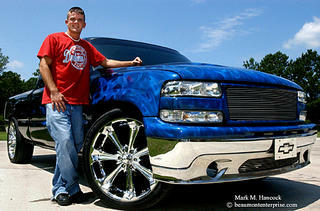 He spent more than $16,000 customizing his 2001 Chevy Silverado Extended Cab LS. He spends about half his income on accessories. (Below) Kevin Kulhanek's truck sits in the driveway of his grandparents' home in Kountze on Friday, July 29, 2005. 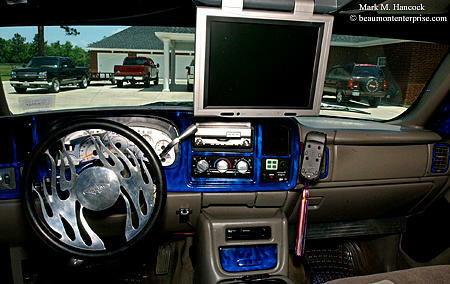 The interior includes a custom steering wheel, custom control panel and three television screens. 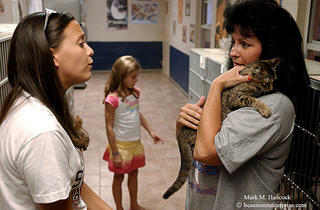 (Above) Amber Williford, 15, (left) pleads with her mother Gana Royse of Lumberton (right) to get this particular kitten while Brooke Royse, 7, (center) continues looking at other kittens at the Humane Society of Southeast Texas animal shelter in Beaumont on Tuesday, August 2, 2005. The family plans to adopt two kittens. (Right) Kittens wait for good homes at the shelter. 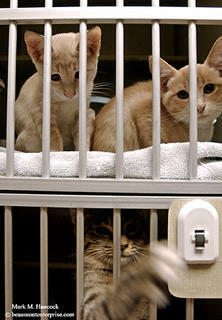 The shelter has about 150 cats, including about 50 kittens ready to be adopted. 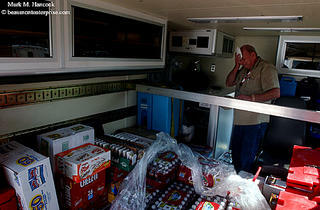 The shelter is also in need of donations to repair the roof as well as a constant need of supplies and volunteers. I know, easy target. We needed a quick feature, and I always want animals to find good homes. Maybe some moms will pick up a kitten or puppy after they drop off their tots for the first day of school. 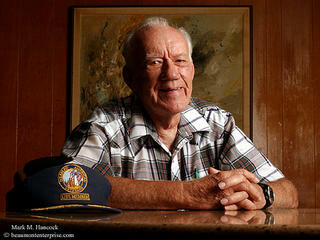 Henry Compton poses for a portrait at his home in Beaumont on Wednesday, August 3, 2005. Compton was the U.S. Navy master at arms for the fleet post office in Sasebo, Japan after WW II. During his tour, he traveled to Nagasaki to see and photograph the results of the atomic bomb. The image we actually ran was more serious because the retrospective package included images he had taken in Nagasaki. Since he's not surrounded by total destruction here, I'd rather show him as a nice guy from Beaumont.